At McDonald’s, soft skills are at the heart of what we do. We know that these skills can really affect a customer’s experience with us, and that they are critical to our employees’ performance, progression and motivation. By 2020, over half a million UK workers will be significantly held back by a lack of soft skills – an issue forecast to affect all sectors. And here’s me thinking they might be held back by the lack of jobs, zero-hour contracts, low pay, crap working conditions and a precarious sense of the future. At the same time, soft skills contribute £88 billion to the UK economy today – with this contribution predicted to increase to £109 billion during the next five years. Now, I’m happy to be put straight by a statistician in our midst, but what evidence and formulae allow this sort of guestimate to have any substance at all? Such doubts don’t worry though the born-again McDonald’s tough, yet sensitive, hard, but soft leadership. We’re spending 2015 championing the hard value of soft skills, together with leading organisations from the worlds of business and education, alongside entrepreneur James Caan CBE. We hope not only to change peoples’ perceptions of soft skills, but also to generate some brilliant new ideas about how to develop them in the workforce so that all employees can benefit from them throughout their careers and lives. Not to mention their hope that this PR exercise might change people’s perceptions of their dodgy, exploitative global company. Now, of course, improving communication, helping folk work in teams is something that arises out of the youth work process and is familiar territory, as it is for many other professions. And, of course, in the workplace it is a commitment more honoured in the breach than in the observance – witness the authoritarian practices in recent decades of the ‘new managerialists’ in the youth service. Nevertheless, for tactical reasons, we might want to welcome McSkills research, but do we have to be so nauseatingly sycophantic about it? We like to talk of ethics in youth work. Indeed the NYA is the guardian of our ethical framework. All of which makes the NYA’s genuflection in the face of young people being told to control their emotions and be resilient all the more offensive. I am bound to ask the question of the NYA. Does this mean that, even though a young person is being ripped off and abused at work, he or she should shrug their shoulders, keep their gobs shut and never seek to chat angrily and emotionally with their team members about their shared situation? In this stifling context it seems reasonable to add a few critical caveats to the cloying embrace of both McDonald’s effort to make-over its image and the ideology underpinning this research, which yet again focuses on so-called skills shortages, upon a deficit model of young people and humanity, rather than acknowledge the regime’s wilful failure of to create socially necessary and properly paid employment. To be going on here are a few. 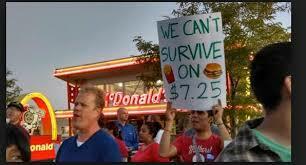 McDonald’s continues to be infamous for its utter hostility to the unionisation of its employees. The European Commission is investigating McDonald’s deliberate avoidance of over €1 billion in corporate taxes in Europe over the five year period, 2009-2013. I can hear the cry that it’s necessary to be realists, to be pragmatists; that you can’t bite the burger that feeds you. If this be so, at the very least, let’s do it through gritted teeth with a growl of dissent in our voice. Grrrr! Previous Contradictory Messages in Surrey : Youth Club too successful?